Pretzel Dough – 3 oz. Isaly’s Chipped Chopped Ham – 2 to 3 oz. Cheddar Cheese, Shredded – 1 to 2 oz. Take 3 oz of dough and roll into a round ball. Stretch ball until roughly 4-5 inches in diameter. 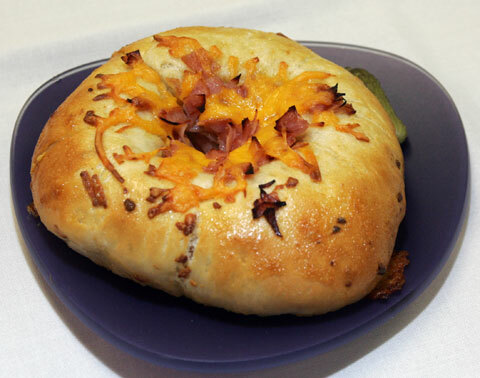 Place shredded cheese and chopped ham very close to the edges of the dough circle; (ingredients should take about ¾ in of space). Bake at 400º F for 11 minutes or until golden brown.